Writer. Radio Host. TV Personality. Public Speaker. Get to know Bee Quammie. Storytelling has been a part of Bee's life ever since she won the "Lunch with Robert Munsch" writing contest in elementary school. Following in the footsteps of the griots that have come before her, Bee uses the multidimensions of media to share her stories, and to help others share theirs. Read on to learn more about Bee and her work. Bee is an accomplished freelance writer who has written for notable digital and print publications. Covering topics spanning race & culture to parenthood to health & wellness, Bee weaves captivating and well-crafted stories that engage her audience. Visit Bee’s digital portfolio to view her work. Bee is a skilled freelance and agency-employed copywriter, bio writer, and speech writer. From crafting internal and external communication strategies for provincial organizations to social media content for small businesses, Bee has a gift for creating outstanding messaging. She provides communications support and leadership for various clients, including non-profit agencies, tech startups, event management companies, law firms, fashion designers, and more. Bee has created custom web copy, email copy, newsletter creation, branded content, social media copy, speech writing, retail product content, bio writing, blogs, ghostwriting, and more. Visit Bee’s Copywriting page or LinkedIn profile to learn more. Bee began blogging in 2006, using the digital space as an outlet for self-expression. In 2011 she launched her blog '83 To Infinity, covering topics around natural hair care, health, culture, and more. In 2014 she began The Brown Suga Mama, detailing stories of motherhood after the birth of her daughter. Bee's digital work has been acknowledged nationally and internationally, with her receiving the Best Blogger Award at the 2014 Black Canadian Awards, and celebrated by Black Enterprise as one of the "most impactful and successful voices in the online space." Bee uses her knowledge and passion for digital media to assist others by offering social media consultations and management to individuals and small businesses. She has helped others to grow and get the most out of their online presences, and has facilitated a number of workshops on social media for grassroots and corporate organizations. 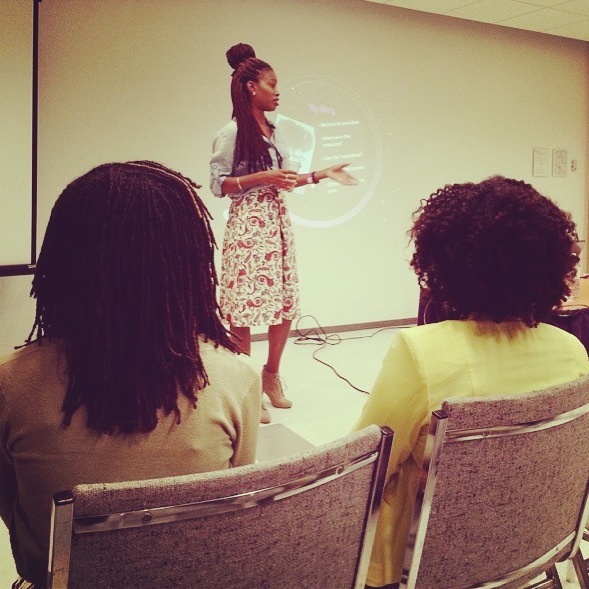 As a public speaker, Bee is engaging, compelling, and knowledgeable. A featured speaker at conferences, events, universities, and workshops across North America, she has addressed audiences on topics like social media, digital content creation, Black womanhood, pop culture, film, feminism, health & wellness, and more through keynotes, panels, and panel moderation. Check out Bee's National Speakers Bureau profile for more information. Bee's storytelling and speaking abilities take her in front of the camera, where she's been a featured guest on television shows like CBC News: The National, TVO's The Agenda with Steve Paikin, and Our Take on Arise TV. She has also been a featured radio show guest on CBC Radio and Global News Radio 640 Toronto, and co-hosts The kultur’D Show. Bee has also conducted on-air interviews with figures such as Jamaican media personality Yendi Phillipps. It started in 2013 when the leader of a Meetup.com group that Bee joined was unable to continue plans for the group's next event. Bee and AMC, a fellow member, stepped up to help - and from there, Bee's event production skills bloomed. Bee's co-produced and co-hosted events include Curls Coils & Cocktails (running annually since 2013), which celebrates natural hair and beauty; The Syndicate, a one-day workshop event on social media and blogging; and The R&B Show, a live conversation party event which tackles different topics about relationships from the perspectives of women and men. Bee's signature solo event, Mirror Images, was born in 2014 and is a panel discussion event that focuses on topics around diversity and representation in areas like media and digital content creation.